Both of Bounds’ home-state senators, Democrats Ron Wyden and Jeff Merkley, opposed his nomination. Ryan Wesley Bounds testifies before the Senate Judiciary Committee during his confirmation hearing to be U.S. Circuit judge for the Ninth Circuit Court of Appeals, on May 9. Photo: Diego M. Radzinschi/ALM. 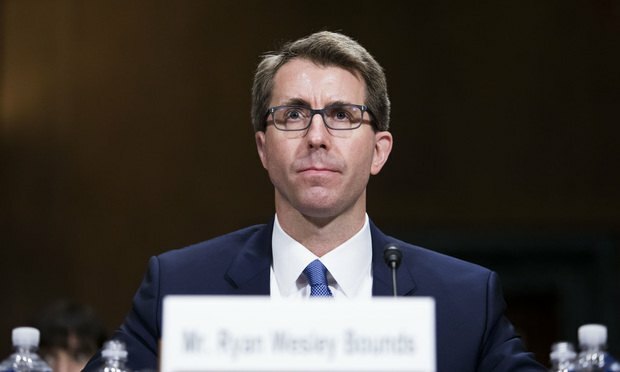 In a dramatic move Thursday, Senate Majority Leader Mitch McConnell withdrew the nomination of President Donald Trump’s pick for the Ninth Circuit, Ryan Bounds, after reports surfaced that his nomination didn’t have enough votes for confirmation.